Post by Regan Breeden, guest blogger, on Lorrie Moore: "The Referential"
Lorrie Moore is a writer who does not shy away from the awkward, gritty moments that permeate everyday life. She presents the readers with characters that are subtle in the way that their voices are distinguished from conceptions of the “average.” She is a master of the tragicomic form — utilizing humor, language and character persona as a way of deepening the human experience of commonly heard stories of illness and tragedy in a way that comes across with a distinct voice that has the cadence of personal storytelling. “Language functions as a shield in Moore’s world,” Elissa Schappell writes of her stories. The reader can feel the deliberate thought behind every writing choice. All elements, down to the referral of characters only as their archetypes, speaks to the way that Moore attempts to carefully construct a perception of the world that is all her characters’ own. Moore understands that “grief is messy and uncontainable” and capitalizes on that fact, allowing her characters to develop organically through the tension and cathartic relief that the humor instills in the reader. Moore explores point of view in her stories, fearlessly changing perspective as a way of making her characters distinct. She does not shy away from bringing the reader close to a character that strains the boundaries of “likeable.” In “You’re Ugly, Too,” Moore explores notions of relatability even as the narrator exists in her own mental world, allowing the reader to glimpse in themselves something of her even as they ponder the madness behind some of her thoughts. In “How to Become a Writer” the reader is presented with a narrator that speaks distantly even as she is drawn close through concretely defined details and clearly recounted life wonderings. In “People Like That Are the Only People Here” the reader feels a perspective shift. Though the point of view creates more of a distance than existed in the previous stories, especially through archetypal nomenclature, the artfully described details of “the Mother finds a blood clot in the Baby’s diaper...startling against the white diaper, like a tiny mouse heart packed in snow” pull the reader into the story with a vengeance. Moore allows for a little craziness to shine through in her stories. In “Referential,” the narrator is made to feel somewhat left of average through both her complicated thought processes and interactions with her son. Everything from her smooth contemplation of jam jars as a present to her need for physical touch that draws her unnecessarily to beauty salons, Moore embraces the peculiarities in her narrator. At the same time frustrating and captivating, the narrator of this story moves the story along through the way that she navigates the complex relationships she has with the men in her life. Even as the reader questions the significance that she places on the more subtle details of her life, the reader nonetheless accepts these obsessions and uses their presence as indicators of the deeper meanings that exist behind her mounting tragedies. 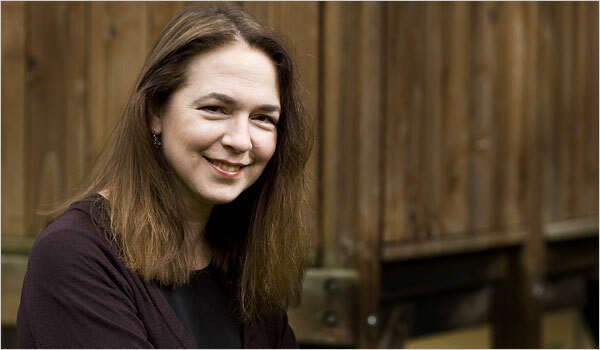 Lorrie Moore is a writer who is intricately aware of the oddities of her narrators. She exasperates these oddities to make them full blown quirks through her careful play with language and detail, even as she instills humor into tragic situations. She is not a writer to be taken simply at face value, but one that should be sat with, observed for style, and questioned for every writing decision she makes. Whether or not the reader sees the depth behind Moore’s writing, it is an unarguable fact that she is purposive, intimately aware of the way that her writing will settle comfortably on the minds of her readers. Post by Audrey Stydinger, guest blogger, on Gish Jen: "The Third Dumpster"
In each of the four stories we read by Gish Jen, the main characters are Chinese-American, and this part of their identity factors into the conflicts of the stories. Jen is Chinese-American herself, and has said of this, “…what I have come to realize is that this business of not being accepted an American does not only affect Asian-Americans, it affects so many people. You sort of wonder who really feels unequivocally American, honestly. You know, it seems that many, many people are subject to this feeling of slight estrangement.” The fact that Jen sees the “Asian-American issue” of being accepted in this country as something that, in some way or other, applies to a large number of people, is reflected in the way she writes. Her main characters don’t identify as either “Chinese” or “American” or even “Chinese-American”; however, they’re surrounded by people who do identify as one of the above and for whom this sense of identity is very important. For example, in the story we’re focusing on, “The Third Dumpster,” Goodwin and Morehouse’s parents are “Chinese, end of story,” but their sons “would never be American, end of story" or anything, end of story. Nevertheless, they are conscious of their parents’ national consciousness, and find that they have to pick their way around it so as not to offend their parents’ sensibilities. Jen’s characters don’t necessarily long for that kind of powerful identity; instead, they feel estranged by those who possess it. There is so much to be taken from Gish Jen’s stories. They deserve far more than one reading each. On the surface, they may be seen as expressions of the difficulties of life as a Chinese-American, but their characters have much more to say about their depth of experience.